Blueberry - Made with Icelandic wild blueberries. Try on salad, chicken, or dessert. Size - 125 grams. Licorice - Salty - sweet with a delicious licorice smell. Delicious on eggs, rice and potatoes, chicken, seafood, dessert. Size - 125 grams. Rhubarb - Made with wild, Arctic rhubarb. Tart and fresh. Try with a salad, cocktails, or seafood. Size - 125 grams. Smoked - Smoked with Birch and Oak. Smooth and light. Use on all food! Size - 125 grams. These sea salt flakes are crisp, clean-flavored, and light. The small pyramid-shaped salt is ideal as a finishing salt on all food, elevating each dish it touches with the taste of the cold northern waters of the Arctic. Organic Nordur Arctic Sea Salt Flakes from Iceland are made using an historic, traditional technique. The geothermal method was first explored in 1753. The Arctic waters are transported into open salt pans where the water is heated and, as evaporation occurs, crisp flakes form. The unique source of heat is from natural hot springs. No additional energy is used to produce this delightful sea salt. The company, Nordur, has a vision of sustainability and everything they do revolves around this core mission. In the old days in the North there was a mermaid named Alda. Her eyes were green and her hair was long and wild. She would sing with such a melancholic voice for the fisherman in their boats that they lost their minds. The only one undisturbed by her haunting melodies was a young fisherman named Brandur. Hardworking and poor, Brandur never stopped fishing and lit bonfires floating in the darkness around his small boat. The light not only attracted fish, but also Alda. Every night she came a little closer to the flames. The moment Brandur's eyes fell upon the mermaid he jumped from his boat and vanished into the sea. Even today, Alda's singing may be heard on quiet nights in the area of Breidafjordur. 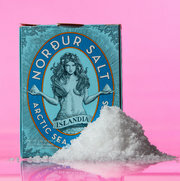 Nordur salt is wonderful, happy to get it in the US! I love Nordur salt. It’s the perfect flaked sea salt. I use it for finishing. I bring it back from Iceland every trip. I was super happy to find salttraders.com carried the salt so I could purchase it in between trips! My fiance has been wanting this style of salt. I got it as a gift for his bachelor party (where they would be grilling out) and it was a HIT. Will be purchasing more! Well balanced salty flavor and amazing texture when you put it on fresh before eating. It's my favorite little box of magic to give as a gift.